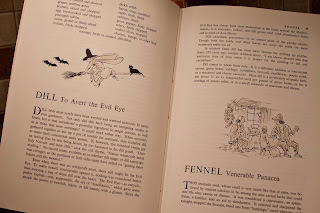 Earlier this year, I started a series of posts on family heirlooms that I have in my home. 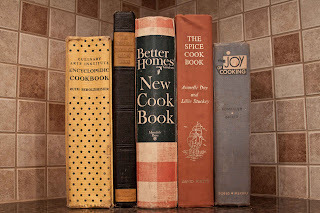 I'll take up the series again here with a visit to my little antique cookbook collection. It is a small collection of five but all the important elder ladies in my life, present and past, are represented by this collection. Interestingly, the first copyright date in this book is 1940, just shortly after the 1939 release of The Wizard of Oz. I wonder where they got their idea for this page? 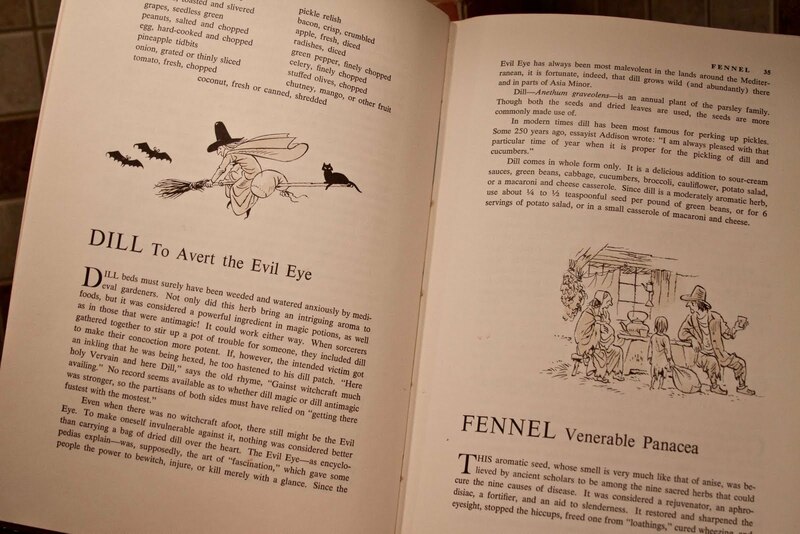 I think the publishers may have borrowed another idea from The Gales of Kansas﻿: the cellar. 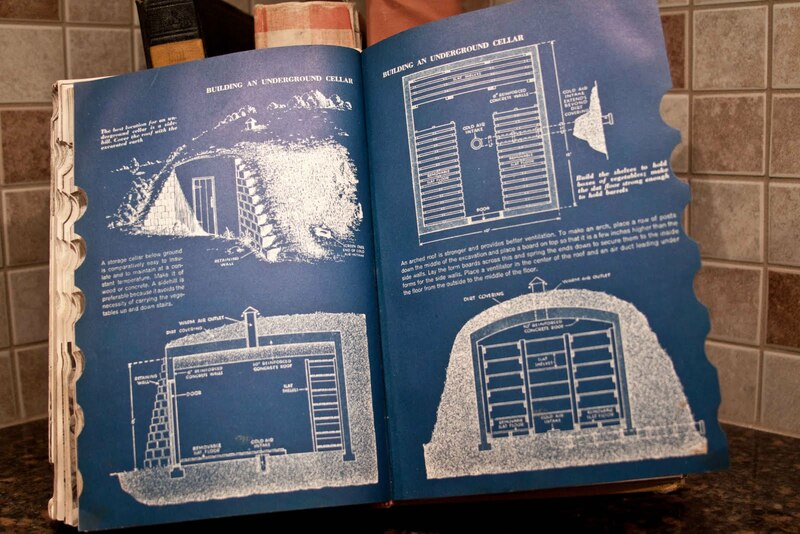 This cookbook goes beyond cooking to food storage and actually has blueprints for building an underground root cellar. I think someone's gingham dress might get a wee bit dirty digging a cellar. For the record, Oma never built a root cellar as far as I know. The next cookbook also belonged to Oma and was given to her by her mother. 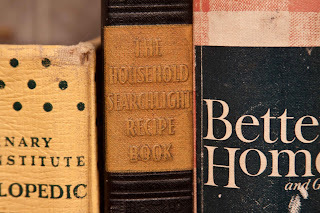 It is the Household Search Light Recipe Book published by The Household Magazine in 1941. "Household Searchlight is a service station conducted for the readers of The Household Magazine. In this seven room house lives a family of specialists whose entire time is spent in working out the problems of homemaking common to every woman who finds herself responsible for the management of a home and the care of children." Sort of a think-tank for homemakers. That's what I envision work life at Real Simple or in the Martha Stewart empire is like. The best thing I found in this book was the answer to "What is hassenpfeffer?" And further, how to serve it. 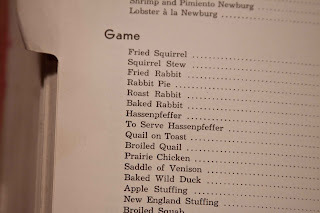 I always thought hassenpfeffer was an insulting euphemism that Yosemite Sam used on Bugs Bunny to keep the cartoons clean. But I was wrong; it's rabbit stew. Now, I can't decide if I should serve hassenpfeffer or fried squirrel for Memorial Day dinner. What do you think? The center book in the collection belongs to my mother-in-law. She gave it to me recently and I was so happy to put it with my others. The Better Homes and Gardens New CookBook is probably the most recognized cookbook cover ever. 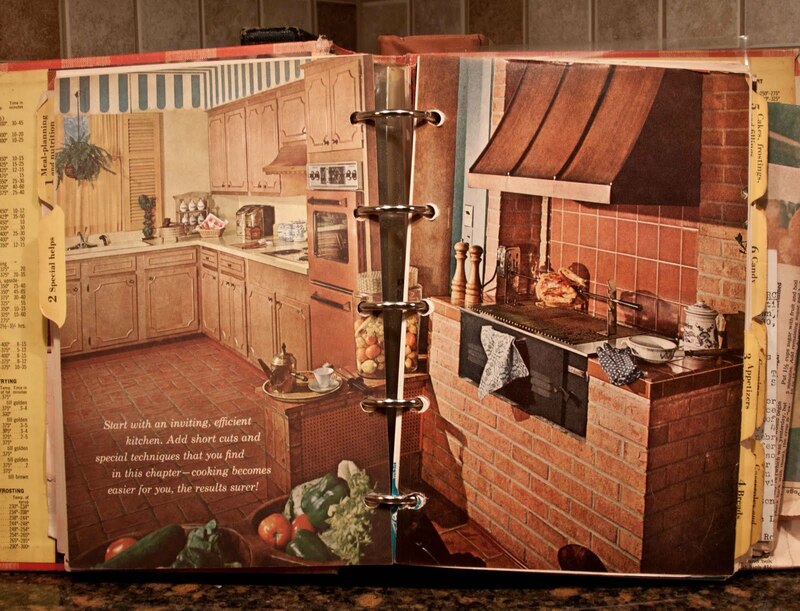 Most women doing any sort of cooking in the '50s and '60s had a copy. This copy shows original copyright dates of 1953 and again in 1962. I also got a bonus in this book in the form of several old notes and recipes handwritten by my MIL. 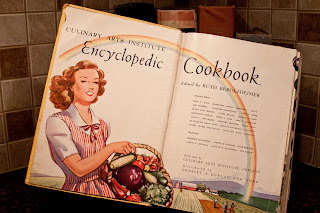 The BHaG CookBook has tons of color pictures and everything looks delicious. My favorite picture is this one in the "Special Helps" chapter showing the "efficient kitchen." I love the rotisserie right there in the kitchen. Anyway, the book did give me further insight into my mother. This totally explains her dill pickle phase. 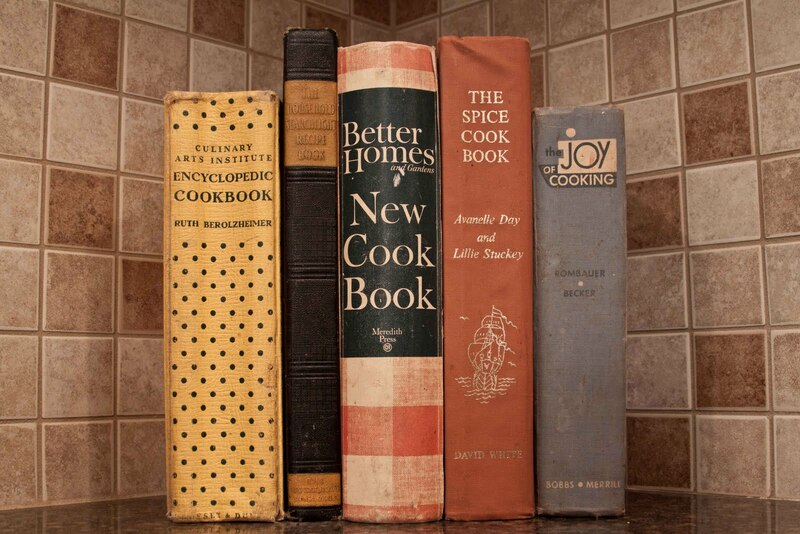 And finally, the must have "Joy of Cooking" belonged also to my mother. She got her copy in 1956. It is a nice comprehensive cookbook but the thing that makes this one valuable is not its age or the book itself. The value of this book lies in what is taped inside. 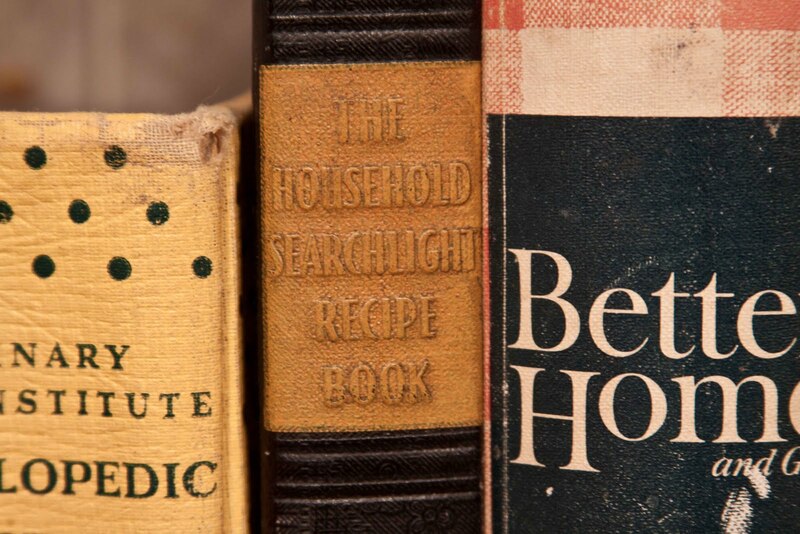 The original copy and only know written form of a valued family recipe was carefully taped to the inside cover of this cookbook. 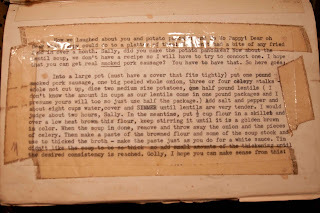 The recipe is my paternal grandmother's recipe for Lentil Soup. The copy seen here was from a typed letter sent from GranMaggie in Belleville, Illinois to my mother in Frankfurt, Germany sometime around 1957﻿. I love the conversational tone of this recipe. 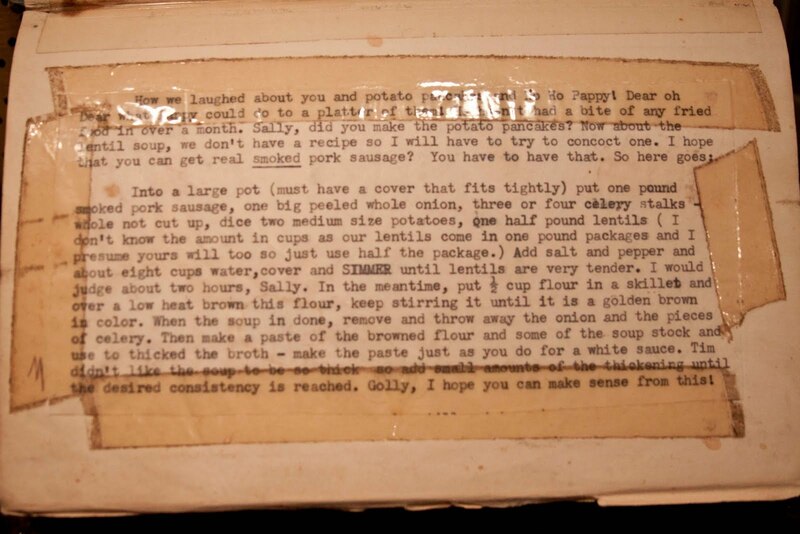 You must know that I am taking quite the risk by divulging the whereabouts of this recipe as certain members of my family may feel that they would be the better custodian of this family jewel. But alas, I have it. And I can cook the authentic family Lentil Soup anytime I want.